As a teacher, or parent, who works in education… we meet a lot of students with different abilities and specialties. And sure, we have Autism Awareness month and disability awareness… but it’s so much more than just being aware. 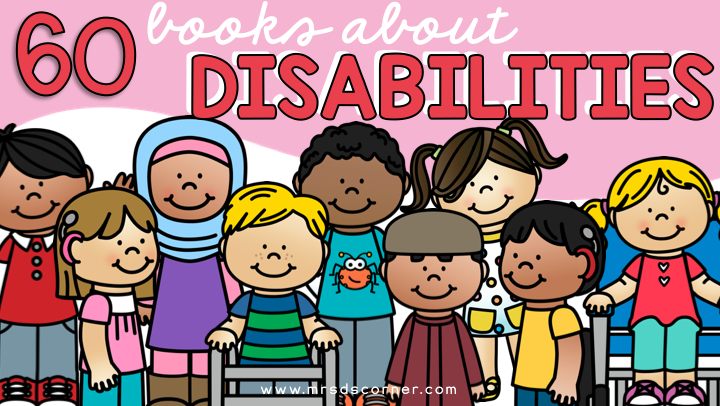 Below you’ll find a curated list of books on special needs, acceptance, and tolerance. There are also books that describe children who have other differences that may make life a little challenging, like walking, hearing, seeing, understanding social cues, and more. These are books that you can use to introduce the topics presented to other children, teachers, and adults. You’ll want to read them over and over again after eagerly adding them to your ever-growing classroom library. Uniquely Wired: A Story About Autism and Its Gifts tells us about Zak, a boy with autism. As Zak describes his point of view, young readers gain a better understanding of his behaviors and learn valuable lessons about patience, tolerance and understanding. Who Are You? : Ella The Enchanted Princess is a story about a young princess named Ella who was different from other princesses, she has no hair. Join along this sweet story about this adorable princess! The Invisible Boy is a gentle story that shows how small acts of kindness can help children feel included and allow them to flourish. Any parent, teacher, or counselor looking for material that sensitively addresses the needs of quieter children will find this book a valuable and important resource. Why Am I Me? is a lovely book celebrating humanity and diversity, inviting readers of all ages to imagine a world where there no you or me, only we. A Friend Like Simon is a special educational book to help introduce children to autism. The Girl Who Thought in Pictures: The Story of Dr. Temple Grandin is a book about the inspirational lives of amazing scientists! I See Things Differently: A First Look at Autism will help children to understand what autism is and how it affects those who have it. Emmanuels’ Dream is the inspring true story of Emmanuel Ofosu Yeboah, born in Ghana, West Africa, with one deformed leg. He was dismissed by most people—but not by his mother, who taught him to reach for his dreams. All My Stripes: A Story for Children with Autism is an encouraging story about being different from your peers, a mother who guides sweet Zane the zebra to help him understand that differences are only one of the many qualities that make him special. Where Oliver Fits is a sweet and funny story that explores all the highs and lows of learning to be yourself and helps to show children that fitting in may not always be the best fit. The Friendship Puzzle: Helping Kids Learn About Accepting and Including Kids with Autism is a lively and upbeat book that sends and encouraging message about the importance of friendship and inclusion. Howie Helps Himself is about Howie, a child with cerebral palsy. Though he enjoys life, he wants nothing more than anything else… and to be able to move his wheelchair by himself. Understanding Sam and Asperger Syndrome is a heart warming story that tells the challenges of living with Asperger Syndrome. Waiting For Benjamin: A Story about Autism is a story about a boy named Benjamin and how his family learns that he has autism. When they learn this, they hire special teachers to teach him how to listen and talk and play. Don’t Call Me Special explores questions and concerns about physical disabilities in a simple and reassuring way. Younger children can find out about individual disabilities, special equipment that is available to help the disabled, and how people of all ages can deal with disabilities and live happy and full lives. Ian’s Walk: A Story about Autism is a sweet read about a sister who takes a walk with her brother who has autism and how he sees the world different than she does. I’m Here reminds us that children and the friendships they make can take flight in unexpected ways! A Rainbow of Friends is a story in verse about how all friends are special and valuable regardless of differences or difficulties. It’s Okay to Be Different targets young children first beginning to read. This book will inspire kids to celebrate their individuality through acceptance of others and self-confidence–and it’s never to early to develop a healthy self-esteem. A Different Little Doggy is a heart warming story that teaches kids important lessons about acceptance and friendship through it’s beautiful and colorful illustrations and rhyming story line. Thank You, Mr. Falker is about a girl named Trisha who realizes that the letters get jumbled when she tries to read! Her teacher, Mr. Falker sees this and helps her prove to herself that she can read and will! Sara’s Secret tells the story about Sara, who has a secret. Her younger brother has cerebral palsy. Keep Your Ear on the Ball is a sweet story about a blind boy named Davey who tries to play kickball! Sure, he misses and tramples a base keeper at first and everyone thinks he should not play, but maybe there is a solution that will work for everybody! Lemon the Duck is a story about a duck that was born with Neurological issues and is taken care of by a classroom of students. They learn through caring for Lemon the duck about acceptance, love, and how extra special care can go a long way! The Pirate of Kindergarten shares the story of Ginny, a kinder girl who sees doubles of everything. With the help of her pirate patch, Ginny can read, run, and even snip her scissors with double the speed! The Black Book of Colors is an extraordinary book giving young readers the ability to experience the world in new ways. It includes Braille letters to accompany the illustrations and a full Braille alphabet to offer sighted readers help reading along with their fingers! Spaghetti Is Not a Finger Food is a heartwarming and charming book about (and told from the point of view of) a child with Asperger Syndrome. Moses Goes to a Concert introduces hearing children to the ASL signs for some of the key words and ideas, in this story about Moses and his friends, who are deaf and use American Sign Language to communicate. Leah’s Voice tells the story of two sisters facing the challenges and difficulties children encounter when they meet a child with special needs, such as autism. Tom’s Special Talent encourages other children to be mindful of the differences that exist between their friends and classmates and to be aware that all children, regardless of their talents, learn differently. The Name Jar is a sweet story about being the new kid in school and a girl named Unhei. Strictly No Elephants is an imaginative and lyrical sweet story that captures the magic of friendship and the joy of having a pet! The Brand New Kid is a heartwarming story about tolerance and the need to give others a chance! This sweet book will entertain and inspire all children in this area! The Seeing Stick is the story of a little girl who is born blind. The emperor tries to find a cure for his daughter. Then, one day a wise old man with a mysterious seeing stick visits the princess. My Friend Has Down Syndrome is a reassuring story about two children (one with Down Syndrome and one without) that learn that they are both good at different things by helping each other overcome their fears and difficulties they can accomplish a great deal together! Susan Laughs follows Susan through a series of familiar activities. She swims with her father, works hard in school, plays with her friends — and even rides a horse. Not until the end of the story is it revealed that Susan uses a wheelchair. 47 Strings. Tessa’s Special Code is an invaluable tool to help talk about Down syndrome with children as it describes in easy-to-understand language as well as with sensitivity towards the challenges. We’ll Paint the Octopus Red is a heartwarming story about Emma and her anticipation of the birth of her new baby sibling. Soon, she finds out that her little brother has Down Syndrome. Throughout the story kid will get answers to some of the commonly asked questions about down Syndrome. Special People Special Ways combine delightful rhymes and beautiful watercolor illustrations to take the reader on a journey of discover and positive images of children with various disabilities. Some Kids Use Wheelchairs is a great book on teaching diversity and tolerance to young readers on the topic of kids using wheelchairs. This book also helps them understand and appreciate those who have health differences. Why Does Izzy Cover Her Ears? tells readers about Izzy, a feisty first grader, whose behavior is often misunderstood as she tries to cope with sensory overload in her new surroundings. This book creates an environment that is accepting of students with sensory modulation difficulties, including many on the autism spectrum. Some Kids Wear Leg Braces: A 4D Book is an engaging text and full-of color photos where readers learn how leg braces can help and what daily life is like for someone who wears them. Some Kids Are Blind is a great book on teaching diversity and tolerance to young readers on the topic of blindness. This book also helps them understand and appreciate those who have health differences. Some Kids Are Deaf is a great book on teaching diversity and tolerance to young readers on the topic of deafness. This book also helps them understand and appreciate those who have health differences. The Alphabet War is a realistic depiction of the long, slow process that leads to Adam’s eventual success as a reader. He sees “p” as “q” and “b” as “d” … and Adam would rather play with clay than read. His teacher wants him to practice, and so begins the alphabet war. Hooway for Wodney Wat shares the story of Rodney Rat, who can’t pronounce his R’s and the other rodents tease him mercilessly. Read along with Wodney as he surprises himself and his classmates by single-handedly saving the whole class from the big bad bully. Those Shoes is all about Jeremy, who wants a pair of those shoes, the ones everyone at school seems to be wearing. This story is great for teaching perspective and how it’s okay to be different. Daniel’s New Friend (Daniel Tiger’s Neighborhood) is a story about Daniel Tiger making a new friend, regardless of their differences! My Friend Has Autism is a sweet book about two friends, one with autism and one not. But that doesn’t matter because they are friends! They enjoy talking about all sorts of fun things. This sweet book brings a fresh light to accepting each other, just as we are. You’re All Kinds of Wonderful is a delightful book encouraging kids to embrace the things that make each one of them unique. We All Have Different Abilities (Celebrating Differences) is a sweet book on celebrating the many talents and abilities that each one of us has. Just Because is an amusing and touching story that encompasses the issue of disability in a charming celebration of sibling friendship. What’s Inside of You Is Inside Me Too is a book that informs people about Down syndrome in a fun, illustrative way. In the process, it also explains chromosomes and their role in making every living thing special. My Three Best Friends and Me, Zulay is a sweet story about a blind girl who, with the help of her friends, enjoys a fun race at school! Whoever You Are is a beautiful book that urges us to accept our differences and to recognize our similarities – but most importantly, to rejoice in both! My Brother Charlie is a story about Charlie, a young boy with autism, told through the eyes of his older sister. Our Stripy Baby tells the story of Zara waiting for her new baby sibling to arrive, but when Zack finally arrives, something isn’t right – he has stripes instead of spots, and he doesn’t look anything like Max. It’s a warm, gentle story about learning to love difference in others. Taking Cerebral Palsy to School is written from Chad’s perspective, a young boy with cerebral palsy. Children, teachers, school nurses, parents, and caregivers will learn about what cerebral palsy is, the different kinds of cerebral palsy, and special equipment that is available to help kids with cerebral palsy. My Brother is Autistic encourage preschool-age and early-grades children to explore their feelings, deal with problems that trouble them, and understand others who have problems of their own. I Have Asthma is the story of a child who suffers from asthma, a chronic condition that sometimes produces frightening attacks. But kids learn that with proper medical supervision and treatment, asthma can be kept under control, and kids who are affected by it can live happy, active, and normal lives. What other children’s books would you add to this list? We love “What Kyle Can Do” for Down Syndrome also!